Do you want to get the smile you’ve always dreamed of, without the inconvenience of traditional braces? Invisalign® invisible braces are designed to help to transform smiles, thanks to pioneering research in dental care. At Dr. Simon Pong, our Invisalign-trained dentists can help you achieve the smile of your dreams. Schedule your consultation with our team today to learn more about Invisalign and how it can help you or your teen regain their self-confidence. Fill out the form below to book a consultation with our dentist and we will contact to you within 2 business days. Invisalign® is a ground-breaking orthodontics technology and the world’s leading clear aligner. Invisalign are the best invisible braces available on the market, with proven results and backed by years of scientific research. These invisible braces offer a cutting edge alternative to traditional metal and wire braces. These custom clear aligners are created from a 3D image of your teeth, so each aligner is individually trimmed to fit your gumline. Invisible braces from Invisalign offer a better looking and better feeling solution for transforming your smile — and the Invisalign cost is affordable and can be separated into regular monthly payments. Invisalign technology works similarly to traditional braces — although the experience is much different. You should wear your Invisalign braces for 20 to 22 hours a day to achieve the best results. You can take them out to eat and drink, and then brush your teeth before putting them back in. 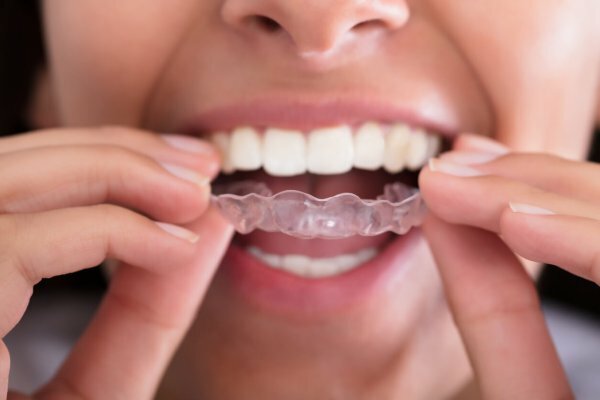 Invisalign allows you to brush and floss normally to maintain good oral hygiene, thereby eliminating plaque buildup, periodontal disease, and tooth decay. Invisalign is completely free of wires, rubber bands, and metal. Patients experience less dental irritation and require fewer adjustments. The Invisalign process has been proven effective in clinical research and in orthodontic practices nationwide. Visit Invisalign.com to learn more. It’s never too late to invest in yourself and your smile. With affordable monthly payments, the invisible braces cost offers a great opportunity to improve your long-term dental health. If you’re interested in adult invisible braces, then Dr. Simon Pong can help you figure out if Invisalign is the right fit for you. Our team has helped many adults and teens transform their smiles with Invisalign braces. Schedule a free consultation with our team today to learn more about the benefits of Invisalign invisible braces for adults. The best in professional dental care for you and your family.